Just enter your email address, and we’ll subscribe you! When you buy a product from us, you buy into a platform, and the platform is something we are commited to improving over time in significant ways. Sometimes we offer such improvements free of charge to thank customers for their continued support of our efforts. Breeze 2.1 is such an update, and it offers some very significant improvements including: P-Link Mode, Chameleon Color GUI System, Sub-Zero Suspend-On-Silence CPU-Saver, 3 New Filter Types for Damp and EQ, and more. 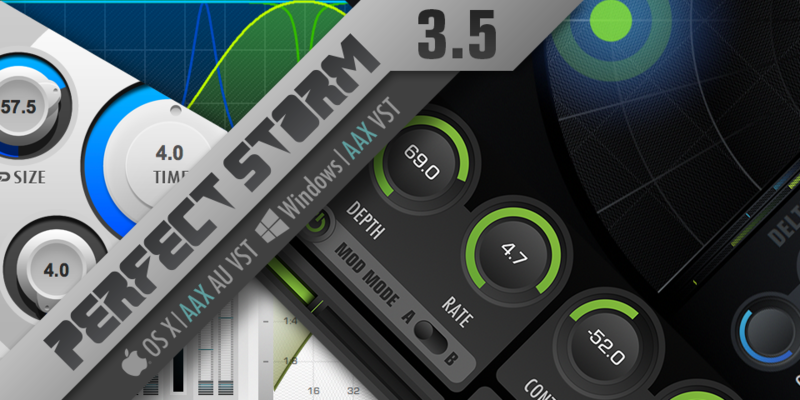 The Perfect Storm 3.5 bundle is comprised of Precedence, Breeze 2, B2, and Aether and all associated Preset Expansions. This bundle is used by some of the world's best artists, film composers, engineers, sound-designers, and producers and includes three award-winning products, our brand new Precedence product that makes all three reverbs even more valuable and over 3,000 presets! It is an entire universe of sound spatialization awaiting exploration. Purchased separately these products would total over $1,000. Purchased together as the Perfect Storm 3.5 bundle, the price is only $499.95 - a savings of more than $500! Breeze 2.0 is the first member of the next generation of our award-winning reverb family. We believe it is one of our best efforts to date! Not only does it sound absolutely sublime, but it is also now one of the most efficient reverbs on the market. It's more than twice as light, twice as pristine, simpler, prettier, and vastly more powerful. It's simply better. Over 800 new presets for Breeze 2.0 are also now available to help you get the most out of it, and we have updated our Perfect Storm Pack to 3.0 to include Breeze 2.0 and the new expansions. It's a trip! Kaleidoscope is the ultimate sound-design tool and creative effects toy! It is an entirely new class of visual audio effects processors and is one of the most unique generative signal processing tools to come to market in recent history. Technically speaking, Kaleidoscope is a massively parallel bank of physically modeled resonators that can be tuned completely arbitrarily with scientific precision and dynamically modulated over time by over two million points of automation. In simplistic terms, Kaleidoscope uses pictures to control sound! Kaleidoscope is both an effects processor as well as a content generator, meaning that it is possible to synthesize completely new sounds without any input sound or MIDI performance data as well as to transform incoming audio signals in other-worldly manners. Music is organized sound. The organization occurs in two axes: time and frequency. Kaleidoscope is a tool that offers ultimate control over musical organization in both of these domains and adds a third axis of creative control we like to call spatial choreography. It is designed with one goal in mind: to inspire and invigorate composers, sound-designers, and artists to push the boundaries of what is possible in cutting edge sound-design. The Breeze Simplicity Expansion is a response to customer requests for more Breeze presets. It was created by our good friend Deneb Pinjo of Aether Preset Expansion fame and offers over 200 new world-class presets. This expansion provides an entirely rethought and redesigned set of presets that can function like an alternative factory preset bank and reinvigorate Breeze for use as a daily-needs algorithmic verb. Regardless of whether your work is in rock, pop, orchestral, electronic, or more intimate acoustic styles, you owe it to yourself to check out these presets. Existing Breeze customers can pick these up for $24.95. It is also now part of the Perfect Storm 2.5 bundle and existing Perfect Storm 2.5 customers can add it to their collection for free. The B2 preset expansions are designed to help customers get the most out of B2 and thoroughly explore all of the new features in version 1.2. The presets included in these products were made by top engineers and sound-designers around the world and together offer over 800 new presets to use either as-is, or as starting points for limitless refinement and customization. The B2 Clarity Expansion has been purposefully designed to demonstrate how the new features in 1.2 can be used effectively to achieve unprecedented levels of detail, spatial impression, and envelopment in standard reverb applications. The B2 Imagination Expansion is an almost limitless well of creative inspiration for artists, composers, producers, sound designers, and engineers who are looking for novel FX-oriented and atmospheric presets. The B2 Duo Den and Solo Den Expansions were created by our good friend Deneb Pinjo of Aether Preset Expansion fame and offer a well balanced selection of predominantly standard-fare, everyday-needs, bread-and-butter algorithmic reverb presets that are designed to achieve that certain ineffable "expensive" sound in a mix that has the effect of perfectly glueing everything together into a coherent image. The Aether Precisions Halls and Small Sublime Expansions were created by our good friend Deneb Pinjo and each offer over 200 new world-class presets. Den's preset work with Aether and other third party reverb products came to prominence over the past three years in online communities such as Gearslutz and KVR. His passion and effort was universally applauded, and many new users as well as Aether veterans have stated that his work is among the best that has been done for Aether in terms of available presets. The Precisions Halls Expansion focusses hall and large space emulations, while the Small Sublime Expansion focusses on chamber, plate, ambience, room, and other miscellaneous emulations. The Perfect Storm 2.5 bundle is comprised of all 2CAudio reverb and spatial FX plug-ins (Aether, B2, and Breeze) and associated Preset Expansions. This bundle is used by some of the world's best artists, film composers, engineers, sound-designers, and producers and includes three award-winning products and over 3,000 presets! It is an entire universe of sound awaiting exploration. Purchased separately these products would total approximately $875. Purchased together as the Perfect Storm 2.5 bundle, the price is only $499.95 - a savings of approximately $375! Perfect Storm 2.0 customers can upgrade to 2.5 for a minor upgrade fee of only $49.95. This upgrade adds seven new preset expansions, and saves Perfect Storm customers over 70% of the price of these expansions. B2 is the third child in our prodigious lineage of world-class reverbs and spatial processors. Each new generation builds upon the lessons learned in the last while offering its own distinctive character and feature set. B2 is a modular dual-engine, non-linear spatial processor featuring built-in harmonic distortion and flexible dynamics. It is our most advanced plug-in to date and is capable of both unprecedented levels creative effects as well as stunningly lush reverbs. It’s modular design enables an almost infinite variety of sonic possibilities. 2CAudio announces the Perfect Storm Bundle 2.0. The bundle includes B2, Breeze, Aether, and all Aether Preset Expansions for a package price of $499.95. This is a savings of approximately $200 or roughly 30% as compared to purchasing all items separately. Existing Perfect Storm bundle customers can upgrade for $149.95. Use the right tool for the right job and join the pack with some of the world's leading artists, composers, producers, and engineers. 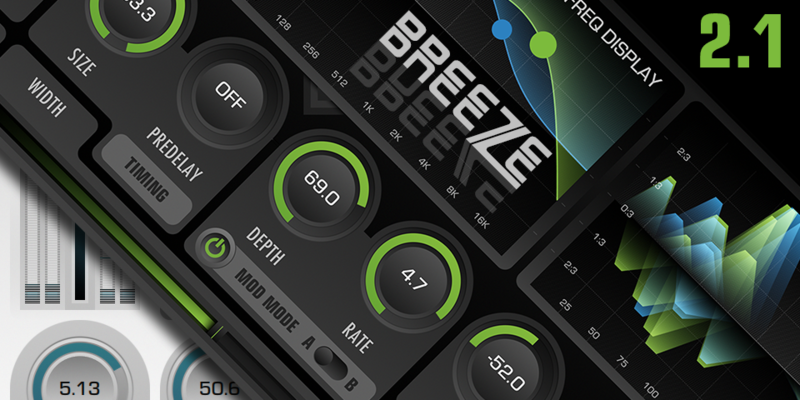 Breeze is an extremely high quality, self-modulating algorithmic reverb. It can be thought of as Aether's pristine eco-conscious cousin and focuses on simplicity, efficiency, and economy. Additionally it offers several of its own exciting new features that have not been offered previously and make it fulfill a special need in the market. Breeze is the ideal reverb choice for laptop use, and live performance. Pack Light. Travel Far. Feel the Breeze. Aether is an award-winning, ultimate quality, self-modulating algorithmic reverb. We believe it is one of the best sounding reverbs on the market at any price point. Aether 1.5 represents a very significant update and offers a huge number of industry-first advances in terms of audio quality and functionality, and is designed to compete directly with the best-of-the-best in both hardware and software. Most reasonable companies would call this a 2.0! This is truly excellence perfected! Ultra low CPU usage is great, but there is one thing even better: zero CPU usage! Beginning with Precedence and Breeze 2.1, we have now introduced an intelligent Suspend-On-Silence feature in our products. If the plug-ins are not receiving any input signal, they will automatically disable processing, and enter an approximately zero CPU usage state! With the release of Precedence and Breeze 2.1 we are introducing our new Chameleon Color user preference system for all our products. This system allows extreme user control over the hue, saturation, brightness, contrast, vibrance, spectral intensity, color harmony, and other more macro design choices in our GUIs. 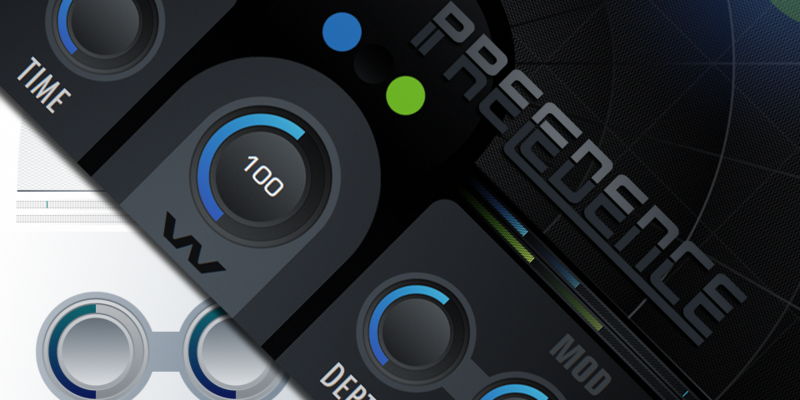 Approximately 150 different Color Preference Presets are supplied pre-made as well. After countless hours of hard work we are pleased to share with you our new web store platform. The venerable Galbanum web store which faithfully served our needs for over a decade has morphed into a new entity, Designer Sound Limited, which is now the primary distribution, order fulfillment, and asset management service for 2CAudio, Galbanum, and other select partners. Designer Sound has been designed to be your centralized hub to learn about and purchase new tools and content as well as to manage your existing assets such as product updates and serial numbers. Your existing account, order history, and assets have been transfered to this new platform. To access them simply logon and go to the My Downloads area of the My Account section of the store. You may use the Password Recovery tool if needed to reset your password. My Downloads is a centralized area that contains all of your product downloads including legacy versions, serial numbers, links to order details, and invoices. It doesn't get much more simple than that! Designer Sound is founded and run by Andrew Souter of 2CAudio and Galbanum. 2CAudio develops software, Galbanum develops content, and Designer Sound markets, sells, and distributes these products as efficiently as possible so that the technical development teams are free to obsessively focus on RnD and product design in effort to create some of the best products in our industry. If you have additional questions, please see our FAQ and other Info Pages. In addition to running 2CAudio and Galbanum which are both known for future-forward technical excellence, Andrew Souter, is also an accomplished composer and pianist. In the near future he is releasing a neoclassical solo piano albumn titled "The Idea Of You" which he describes as "the first of a trio of solo piano albums that have been two decades in the making". He further comments: "This my most personal and intimate music. It explores the delicate seasons and contour of life, the vicissitudes of romantic love, and all the lessons learned along the way. I hope it may it help people on their journey, as it has me..." Stylistically the project seats itself firmly between modernist minimalism and lyrical romanticism and credits influences such as Einaudi, Tiersen, Mertens, Nyman, Winston, Sakamoto, Hearts of Space and many others. Preview and full excerpts from the project are available to listen to here on SoundCloud. If anyone has interest in discussing this project for any reason (review, sync licensing, remix, collaboration, etc.) please contact us. B2, Aether, and Breeze are used extensively in Andrew's music of course - subtly on "The Idea Of You", and in more extreme measures on his various Wayfarer ambient music projects. B2, Aether, and Breeze 64-bit OSX AU and VST public customer betas have been available now for several weeks and have no known issues. Update instructions are available in the Updates area of this web-site under the Support menu. These updates bring many enhancements to Windows users as well. New orders receive these latest versions automatically at this point. We are still completing one final task in this update cycle, namely AAX support for all three products. We have also managed to sneak in some exciting new features to B2 while completing this other work. Final updates will be free to all customers. Once AAX support is complete there will be an official announcement. The B2 64-bit OSX port is now done and has been available as version 1.1.0b for several weeks now to our internal beta team and any customer who follows the KVR, Gearslutz, or VI-Control forums. There are currently no known issues and we consider it to be a stable release build. B2 1.1.0b is available to try today. There are two new additional things that we have decided to add to this update cycle: AAX support and preset browser enhancements. We are completing these tasks now. When these are complete B2 will become the official version 1.1.0 in a second update. Aether and Breeze will be next and will obtain all of the benefits that B2 has with our new GUI and systems code-base. We are honored and humbled to announce that Sound On Sound magazine has nominated 2CAudio's Aether the prestigious 2011 SoS Annual Award for "Best Software Plug-in: Effects". This is a very prestigious award from a very well respected publisher, and we are very grateful to receive this nomination. This is a user-chosen award. We thank you are for you continued support in helping propel Aether to the heights it has achieved. Let's see just how far we can take things. 01/01/10Aether Wins the EM Editor's Choice! We are honored and humbled to announce that Electronic Musician magazine has awarded 2CAudio the prestigious 2010 Editor's Choice award for Best Signal Processing Software. This was for version 1.0. With version 1.5 out now, we hope to continue our legacy even further.